Let's face it. In order to keep up with what people are talking about, you're going to have to breakdown and check out Pinterest. We have auser ID now too. It's a wonderful way to collect tons of teacher ideas, classroom resources, recipes, crafts, YOU NAME IT AND IT IS THERE. Pictures and step by step instructions lay everything out for you. You "pin" the items that you like and it saves them to your profile. You will find ideas on everything from organizing your room to throwing parties to forms and templates. You can go back and review your pins anytime or search for new ideas. Here is just one example of the creative things you can discover. Make your own hand sanitizer. 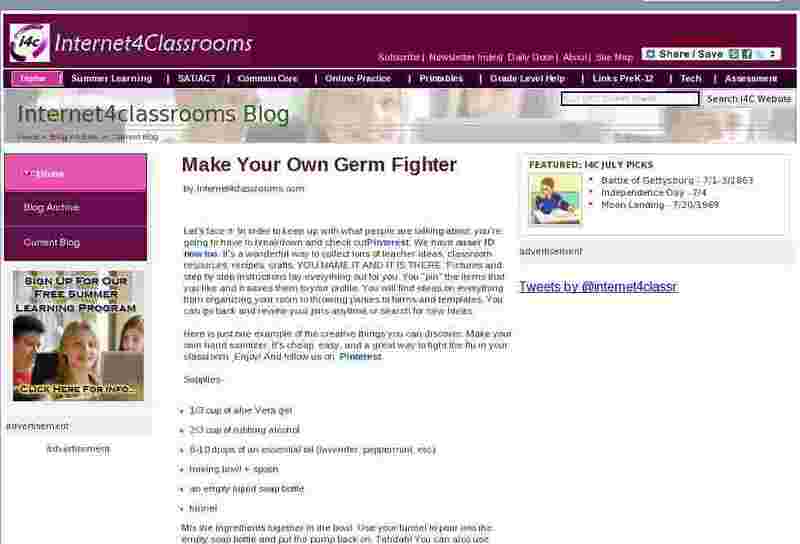 It's cheap, easy, and a great way to fight the flu in your classroom.�Enjoy! And follow us onPinterest. Mix the ingredients together in the bowl. Use your funnel to pour into the empty soap bottle and put the pump back on. Tahdah! You can also use glitter pens or sharpees and label/decorate your containers. They make great gifts.